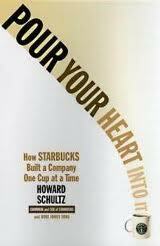 Click here for 12 full quotes from Howard Schultz in the book Pour Your Heart Into It, by Howard Schultz. I decided that now was a good time to tell the Starbucks story. First, I want to inspire people to pursue their dreams. Second, and more profoundly, I hope to inspire leaders of enterprises to aim high. Success is empty if you arrive at the finish line alone. The best reward is to get there surrounded by winners. The more winners you can bring with you--whether they're employees, customers, shareholders, or readers--the more gratifying the victory. I'm not writing this book to make money. All my earnings from it will go to the newly formed Starbucks Foundation, which will allocate the proceeds to philanthropic work on behalf of Starbucks and its partners. This is the story of Starbucks, but it is not a conventional business book. The key is heart. I pour my heart into every cup of coffee and so do my partners at Starbucks. When customers sense that, they respond in kind. Perhaps Schultz will run for office someday; in the meantime, he has positioned himself as a political opinion leader with this book. A must-read for coffee aficionados (sorry, we don't excerpt those parts here!) that may become a must-read if Schultz ever makes the leap and enters the arena. Support AIDS programs and employee AIDS walks. Build a big business on small business values. People worry that national chains homogenize neighborhoods. Support worthy causes in countries where our coffee is grown. Paper sleeves instead of polystyrene coffee cups. CARE programs in rural areas in Third World. Framework for coffee importers: improve quality of life. Expand coverage to include part-time employees. Offer employee coverage for terminal illnesses. Pour Your Heart into It: the story of Starbucks. 1997: Appropriate Technology Initiative in Guatemala. Donates 8-day-old coffee beans to food banks. by Howard Schultz, Dori jones Yang.